How can I tell if I have a 64-bit OS? How can I download videos with RealTimes (or RealPlayer) if I do? Windows 8 and 10 PCs run 64-bit Internet Explorer by default; however there is a built-in 32-bit add-on that means the browser can also operate as a 32-bit browser and should be compatible with Download This Video. 2. Click the cog icon in the upper right to open the Tools menu. 4. Make sure "Enhanced Protected Mode" is un-checked. 2. If there's no mention of 64-bit, you are using 32-bit. 7. Select Send To Desktop (create shortcut). 8. Rename that shortcut so you know it's the shortcut to IE 32-bit. 1. If you are using Windows XP, click the Start button in the bottom left corner of your screen. If you are using Windows 7 or Vista, on the Windows logo at the bottom left corner of your screen. 2. Select "All Programs." You will find a list of shortcuts of programs installed on your computer/laptop. 3. 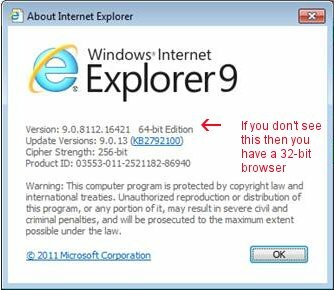 Scroll up to find the shortcut for "Internet Explorer (32-bit)" browser. 4. Click on the shortcut to launch a 32-bit Internet Explorer on a 64-bit Windows operating system.